Enthusiasm for and interest in alternative medicine is at a fever pitch all over the world. The public has been constantly exposed to personal situations where side-effects from pharmaceuticals have created serious health problems for themselves or their loved ones. We are all being relentlesssly bombarded by law firm sponsored TV commercials looking for victims of pharmaceutical side-effects. Then we have to endure a steady stream of pharmaceutical commercials and their ghastly list of side effects like “suicidal thoughts, some cancers have been reported, blindness, etc.” Can you blame the public for seeking alternatives? 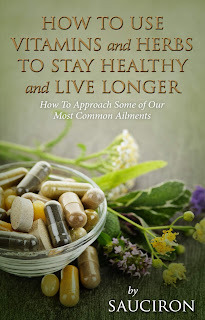 Sauciron, the author of two previous books on alternative health, has produced his third in the series. It consists of 35 Vitamin, Herbal, and Holistic Supplement reviews. He also details the prevention and treatment of 20 of our most common ailments.